I recently published issue #100 of the Work Better, Not Harder newsletter. When I started it, I didn't envision how long it would last. In fact, I didn't look very far into the future at all - I just did it, and kept doing it. It's changed quite a lot since that very first issue (I even had a different logo back then) but my focus has always been to give good value to small business owners. When I told some friends that I wanted to do something special for my subscribers to celebrate, the idea of a '100' list was born... about a month ago. Since then I've had a computer crash and some software problems but I've been working furiously when I could. It's amazing how a publicly announced deadline can motivate! Until the end of August 2016, I'm giving away my plan - 100 Days of Content Creation and Promotion - for free to regular subscribers of either our newsletter or blog. It won't be for everyone but, if you are a small business owner doing your own online marketing, you'll find value inside. Beginners - It's written with you in mind. In Between - Even if you've been doing your own online marketing for a while, you'll benefit from the routine. Experts - Always looking to up your game, you'll find some ideas inside that you haven't tried yet. 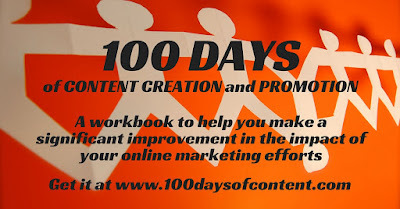 Go to 100daysofcontent.com and grab it now!